HomeVocabThe Hindu Vocab 13th September 2018 For Competitive Exams. The Hindu Vocab 13th September 2018 For Competitive Exams. 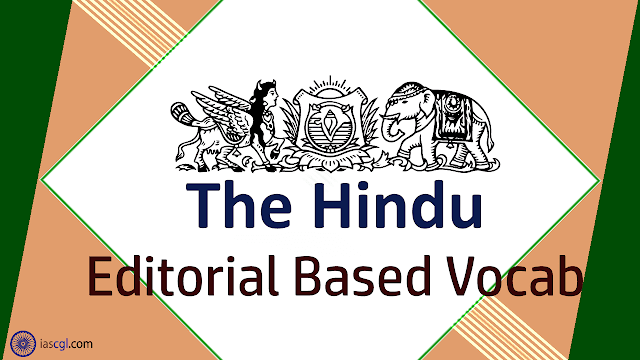 Vocabulary from The Hindu Editorial 13th September 2018 for Staff Selection Commission(SSC) Combined Graduate Level, Combined Higher Secondary Level, Bank PO, Clerk and other state Government Examination. Former RBI Governor Raghuram Rajan’s note of caution on the next financial crisis that could be building up needs to be taken in all seriousness. In his note to Parliament’s Estimates Committee on bank non-performing assets (NPAs), Mr. Rajan has flagged three major sources of potential trouble: Mudra credit, which is basically small-ticket loans granted to micro and small enterprises; lending to farmers through Kisan Credit Cards; and contingent liabilities under the Credit Guarantee Scheme for MSMEs, run by the Small Industries Development Bank of India. The disbursement under Mudra loans alone is ₹6.37 lakh crore, which is over 7% of the total outstanding bank credit. These loans have been sanctioned under the Pradhan Mantri Mudra Yojana, which aims to ‘fund the unfunded’, and is a signature scheme of the NDA government. Given that these are small loans up to ₹10 lakh each, with the borrowers mostly from the informal sector, banks have to monitor them very closely. It is debatable whether banks have the resources and manpower to do this when they are chasing the bigger borrowers for business and, increasingly these days, recoveries. The risk is that these small-ticket loans will drop under the radar and build into a large credit issue in course of time. The same logic holds true for crop loans made through Kisan Credit Cards. Mr. Rajan’s advice on loan waivers has been made by him and others in the past. But the political class has chosen to turn a deaf ear to this advice, vitiating the credit culture and creating a moral hazard where farmer-borrowers assume that their loans will invariably be waived off. The former RBI Governor has strongly defended the RBI against criticism, often unfair, over its policies on NPA recognition and resolution. He rightly termed as “ludicrous” the allegations that the economy slowed down because of the RBI. Recognition is the first step in a clean-up, and unless banks are cleaned of their non-performing loans, they cannot make fresh loans. The Central government should also take note of some forward-looking statements that Mr. Rajan has made on the governance of banks. Among his suggestions to avert a recurrence of the current mess are, professionalising bank boards with appointments done by an independent Banks Board Bureau; inducting talent from outside banks to make up for the deficit within; revising compensation structures to attract the best talent; and ensuring that banks are not left without a leader at the top. It is a comment on the state of our polity that despite the important issues that Mr. Rajan raised, political parties have chosen to pick only the points that are convenient to them — about the period when these bad loans were made and the purported inaction over a list of high-profile fraud cases highlighted by him. Sage: साधू - having, showing, or indicating profound wisdom. Heeded: मान ली - pay attention to; take notice of. Contingent: आकस्मिक - subject to chance. Debatable: विवादास्पद - open to discussion or argument. Vitiating: बिगाड़ने - spoil or impair the quality or efficiency of. Ludicrous: ऊटपटांग -so foolish, unreasonable, or out of place as to be amusing; ridiculous. Deficit: घाटा - the amount by which something, especially a sum of money, is too small. Purported: कथित - appear or claim to be or do something, especially falsely; profess.